Weeding is most effectively done when the weeds are young and in the morning on a sunny day. Together, those two tactics will result in the highest mortality rate. Young weeds are simply easier to kill and all weeds are easier to kill when the afternoon sun is available to desiccate their disturbed foliage and roots. Also, although there seems to be an unending supply, there really are just so many weed seeds available in the 'weed seed bank' — that collection of weed seeds lying dormant in your soil, awaiting favorable conditions to germinate and cause you problems. 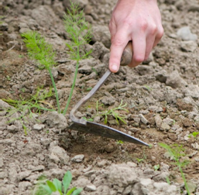 Weeding while the weeds are young and have not gone to seed, works to effectively deplete the weed seed bank and eventually will result in relatively weed-free conditions. But, you have to be diligent and proactive in order to ever achieve that. Also known as the Nejiri Gama Hand Hoe, this low-cost, lightweight tool becomes an extremely sharp and precise extension of the user's arm when in use. 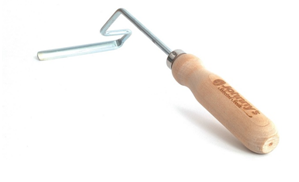 It is by far our best-selling, small hand tool. It sports a D-shaped, high-carbon steel blade welded to a steel shank, set in a wooden handle. These are great low-cost tools for growers to equip their entire farm crew with for detailed in-row weeding in the field. 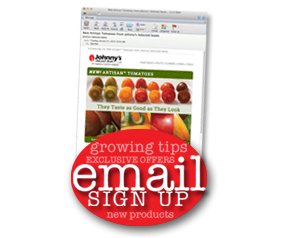 This tool was recommended to us by Paul and Alison Wiediger of Au Naturel Farm in Kentucky. The Wiedigers prefer this European-made tool for detailed weeding in their hoophouses. 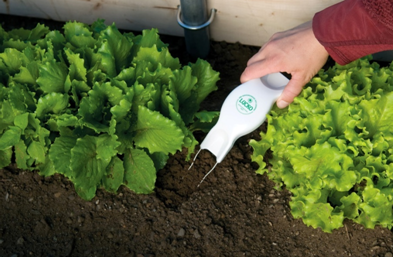 The round wire design creates the business end of a tool that won't cut drip tape but will easily upend young weed seedlings. It has a narrow end for weeding between closely spaced crops like dense plantings of baby leaf lettuce, and a wider end to cover more ground in open areas. 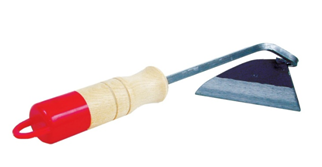 This short-handled version of one of Eliot Coleman's favorite tools is perfect for in-row weeding of closely spaced crops like salad mix, carrots and onions, as well as perennial flowers and herbs. 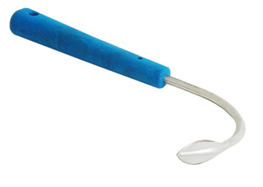 Three round, spring-steel tines scratch the soil just enough to uproot smaller weeds while loosening the surface soil, allowing water and oxygen to penetrate. Great for cultivating tight areas. This is also known as the traditional Korean hand plow and dates back over 5000 years. It has multiple curves in its forged design that impart strength as well as function. 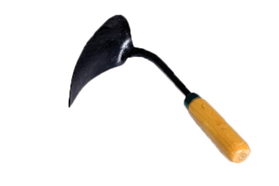 It can be used to dig, furrow, weed, cover seed, transplant seedlings, and loosen, level, cultivate, and mound soil. This short-handled version of the Cobrahead has a tough, sharp steel blade and comfortable handle that makes fast work of tedious garden chores. 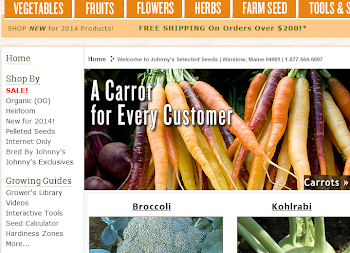 Used to weed, cultivate, make small furrows, and even as a mini trowel for small transplants. 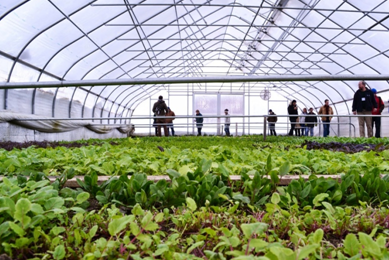 This is a practice that many farmers swear by, especially for dense, hard-to-weed crops like baby leaf lettuce or greens. In this method, the bed is prepped for planting a couple of weeks prior to seeding and weeds are allowed to grow. Just before seeding the grower will flame the bed, killing any weeds that have started to grow, and then seed into a so-called 'stale bed.' After that, the crop should come up nearly weed-free. The labor and fuel costs associated with flaming are usually far less than the cost to hand weed these dense beds or cull out weeds in the wash water, so the method pays for itself. Thanks for reading and best of luck in your own personal battle against weeds. On the market, there are many models of broadfork tools, which differ from each other by the size of the working part. It took a lot of time, but I found this product the best one, bought it and now happy as hell. You have you try!